Sealaska Heritage Institute (SHI) will donate eight, large panels depicting ancient Southeast Alaska Native core cultural values to Floyd Dryden Middle School in a ceremony planned for next week. The panels, which stand five feet wide and nearly seven feet tall, were a main feature of SHI’s first exhibit at the opening of its Walter Soboleff Building in 2015. The panels are in the shape of a tináa or copper shield, a symbol of wealth and commerce signifying the riches that came from the ancient interrelationship and trade among the Tlingit, Haida and Tsimshians and neighboring tribes. They were originally affixed to double-sided structures so there are two panels per value. The panels tell of traditional values that have helped to sustain the Tlingit, Haida and Tsimshian cultures for thousands of years. The values are so important they are instilled in young Native people to this day, said SHI President Rosita Worl. “Our ancient values are as relevant now as they were more than 10,000 years ago. 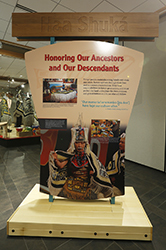 We created the panels to highlight the wisdom of our ancestors, and we are offering them to the school to share these values with all children,” said Worl, noting the donation underscores SHI’s goal to promote cross-cultural understanding. It took nearly eight months to curate content and to manufacture the panels, which are made of a heavy composite material. The panels were on display in the Nathan Jackson Gallery, which will feature a new exhibit in 2018. The transfer ceremony is scheduled at 2:00 p.m., Wednesday, Nov. 22, at Floyd Dryden Middle School. Principal Jim Thompson will be on hand to accept the gift. Speakers will include Vice Principal Haifa Sadighi, Indian Studies Director Barbara Cadiente-Nelson, Paul Marks (Raven, Lukaax.ádi), David Katzeek (Eagle, Shangukeidí) and SHI President Rosita Worl. Goldbelt Heritage Foundation is assisting with the ceremony. Captions, from top: Haa Shuká panel as originally displayed in the Nathan Jackson Gallery. 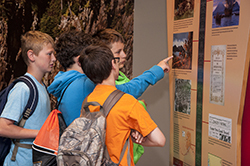 Visiting students examine the Haa Aani panel during a visit to Sealaska Heritage. Photos by Brian Wallace.